Today I am observing the rates of change embedded in Barack Obama’s budget projections. My objective is to determine whether Obama represents ‘change you can believe in’, and whether or not his policies are in line with his rhetoric. I will compare Obama’s 4 year budget projections during his first (and only) term, to the previous 16 year period. An observance of rates of change can provide assurance that the course charted is the one navigated. Here are a few observations. 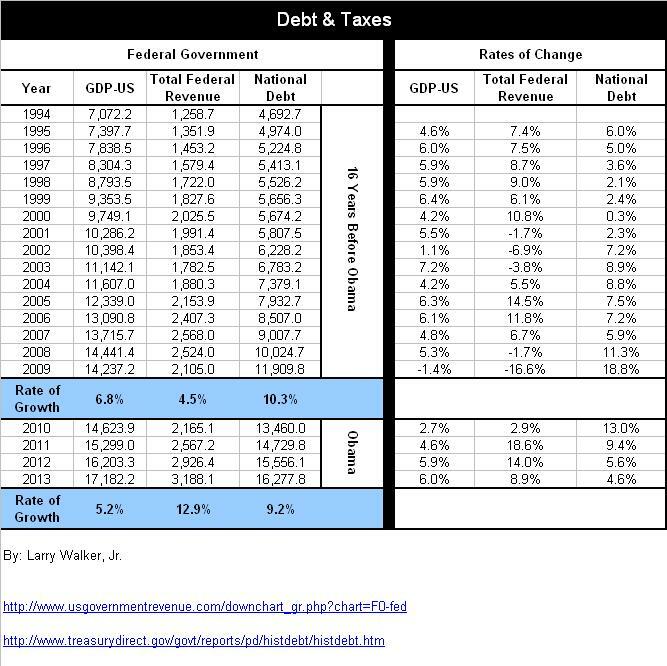 During the 16 year period ending with fiscal year 2009, GDP achieved an average annual growth rate of 6.8%, while government revenues (taxes) grew at 4.5%, and the national debt grew at 10.3%. Summary: The national debt outpaced economic growth, while tax revenues lagged the economy. In following Obama’s budget projections for the four year period ending in fiscal year 2013, GDP will grow at an average annual rate of 5.2%, while government revenues (taxes) will grow at 12.9%, and the national debt will grow at 9.2%. Summary: Tax revenues will more than double the pace of economic growth, while the national debt will continue to grow faster than the economy. GDP will grow at an annual rate which is 23.5% slower than what we experienced over the last 16 years. This means that our wealth will be diminished. Income taxes will increase by 186% over the next 4 years. Taxes will consume more of a shrinking economy. Although the National Debt will grow at a slightly slower pace, it will: (a) grow 77% faster than GDP, and (b) continue to grow in spite of massive tax increases. Conclusion: The course Obama has charted, is not the one being navigated. Obama talks about controlling the debt and deficits, cutting taxes for 90% of working families, and building a new foundation for economic growth. The only problem is that by following his budget, we will experience an increase in the national debt, higher income taxes, and lower economic growth. This is ‘change’, but it is the kind of change that I cannot, do not, and will never believe in. It turned out to be worse than my original calculation. Unlike whitehouse.gov, I have no problem making revisions. Updated!